If I had an extra minute to spare I would seriously consider starting another blog focused strictly on covering the growing number of on-point reissue labels that have popped up the past several years. One of these, a front-runner I must feature on AD close to six times a year, is the Chicago based Numero Group. At this stage in the game, with the amount of stellar titles they’ve released, the label’s reputation alone sets a precedent for quality even before you open the package and put on your headphones. Next up at bat: the early seventies funk of 24-Carat Black — Gone: The Promises Of Yesterday LP. 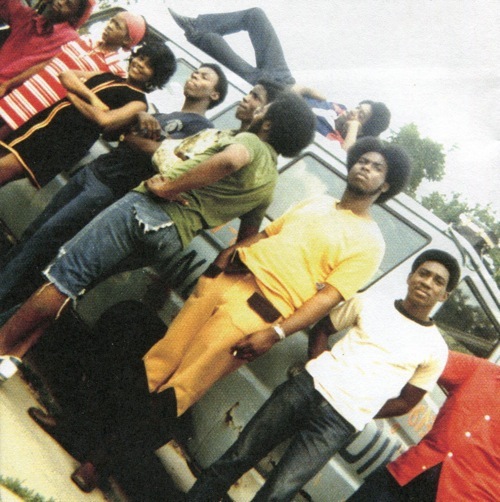 I first happened across 24-Carat Black unknowingly, due to the heavy sampling of their music, and explicitly via a post over at Oliver Wang’s Soul Sides blog. His depiction of the group’s sole release, Ghetto: Misfortune’s Wealth, had me immediately digging for a copy (an easier task now that it’s avail at eMusic). The album is an essential listen for those interested in early seventies soul/funk/r&b. Obscure in mainstream circles; well known to those who obsessively crate dig and/or hunt beats and grooves. Numero Group is garnering a rep for its ability to pull rabbits out of hats, and this, the release of Gone: The Promises Of Yesterday is no exception. Listen to it, in its entirety, here on the Numero Group website. And if the title Ghetto: Misfortune’s Wealth is new to you, do be sure to check out the “24-Carat Black Theme” and “In The Ghetto,” both below. For :”Synopsis 2″, Why didn’t they just do a straight cover of Can’s Vitamin C? Oops, I meant Synopsis Two: 24-Carat Black (Theme). I know, right?, i should post the side-by-side. Can’s Vitamin C(19730 was rwritten almost 1 year after the theme1972. Also can’s song is a simple 1 bar phrasing of the 1-5-8-10 bass melody. 24 Carat Black used both 4 and 8 bar pkrasing. Can is the copy.